Foot pain is never convenient, but your foot care always should be. Welcome to our office in Hanover, PA. We know that foot pain is not meant to be normal, and we fully believe you shouldn't have to live with it. Our friendly, welcoming team of experts is here to help get you back on your feet without discomfort and enjoying your active life as quickly and easily as possible. Whether you’re an active athlete, work on your feet, or just live a busy life, you are susceptible to foot and ankle issues. Most people wait too long to seek help for problems with their lower limbs. They believe that foot or ankle pain is “normal” and accept it—at least until it grows too uncomfortable and interrupts daily life. Our highly-trained podiatrists and staff are here to help you through every possible stage of your foot care, from recovering after an injury to preventative treatments. 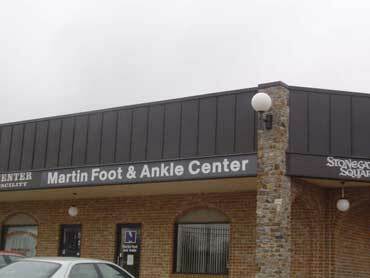 The Martin Foot and Ankle office in Hanover is fully equipped to handle whatever lower limb issues you might have, making it easier and more convenient for you to manage your foot care. Trouble with skin and nails? Need expert physical therapy? We have everything you need to correct foot problems, banish pain, and set you on a path to living with healthy feet. Life is packed full of responsibilities. It can be hard to find time to schedule an appointment to take care of your lower limb needs. That’s why we make it as easy for you as possible through our online scheduling. Simply fill out the form with your contact information, a brief description of your foot problem, when you’re available, and your preference for the Hanover office, and we’ll reach out to you to set it up. You can also prepare beforehand by filling out our patient forms. Simply download them at home, print them off, and bring the completed forms with you to your appointment. Remember to bring your insurance cards and a photo ID with you as well. We partner with many providers and want to make the insurance process as painless as possible for you. Call ahead if you’re not sure we partner with your provider.